Anybody who plans to travel to Xinjiang knows that Uyghur food and other local cuisine is going to be a memorable part of their journey. 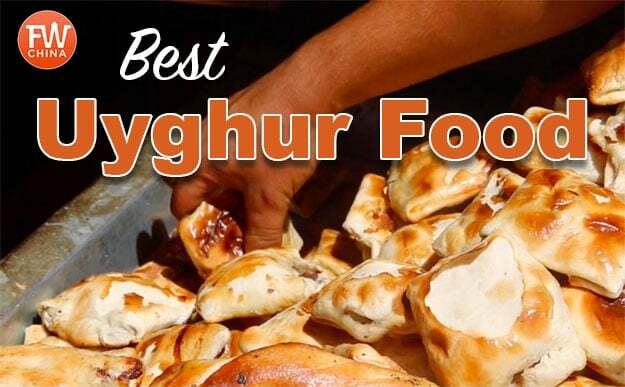 The local Uyghur food is well-known throughout China and praised among travelers. It’s not just Uyghur food, though. 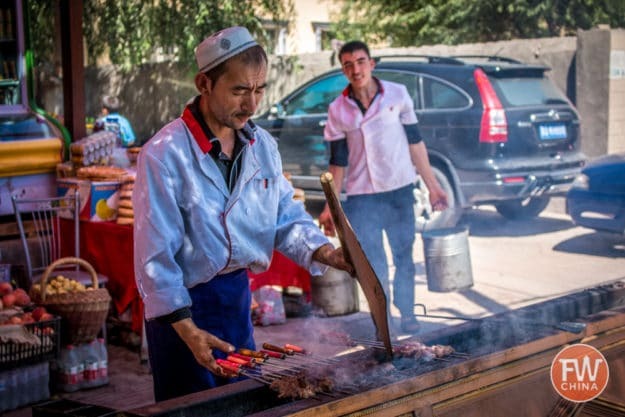 Whether you want to eat Hui food, Kazakh food or Chinese food – Xinjiang has it all. Unfortunately, not everybody knows what to eat…or even how to order it! That’s where you’ll find this guide and video useful. It doesn’t matter if you eat in a restaurant, on the street or at a grand bazaar, you’re likely to run into the same types of foods wherever you go. The following recommendations for good Xinjiang food obviously don’t cover everything there is to try…but it’s a good start. If you have the opportunity to eat each of these foods at least once while you’re here, you will have had a well-rounded taste of Xinjiang cuisine. NOTE: I realize that some people may take offense at my use of “Xinjiang food” or “Xinjiang cuisine”. I choose to sometimes use this phrase not out of discrimination against the majority Uyghur people but out of recognition that the region’s cuisine is comprised of multiple ethnic groups – Uyghur, Hui, Kazakh, Tajik, etc. Because the written word doesn’t accomplish enough in the quest to describe ethnic cuisine, the next best thing besides taking you to a restaurant is to show it to you. Take a few minutes and join me here in Xinjiang as I introduce my top 10 favorite Xinjiang dishes! Subscribe to FarWestChina on YouTube! Would you like to have an easy reference guide of these and many other Xinjiang foods? 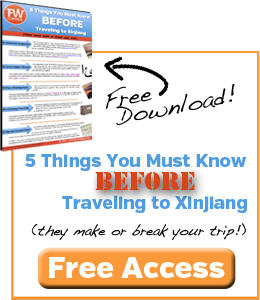 Click below to download the FarWestChina guide that gives you all of these foods written in English, Chinese, Pinyin and Uyghur! To give you a quick rundown, here are the ten foods I recommend you try while traveling to Xinjiang. You may not like each and every one of them, but you won’t regret at least giving them a try. I promise you! Known throughout Central Asia as “rice pilaf”, Uyghur polo is a tasty mix of rice, carrots and lamb meet slow cooked in oil. 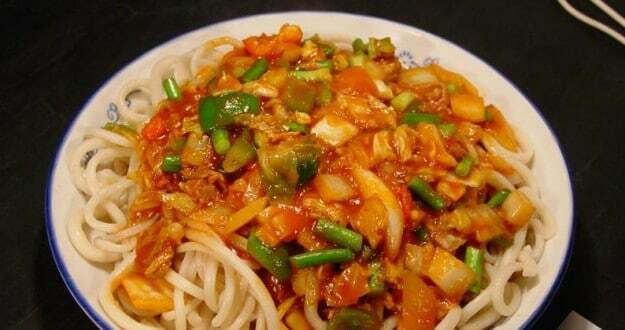 It is without a doubt the most popular Uyghur dish in Xinjiang. You can request this dish by just saying “polo”. It is known in Chinese as 抓饭/Zhuāfàn. The Uyghur and Hui have similar dishes here – laghman and banmian. The concept is simple: pulled noodles covered in a concoction of meat, vegetables and oil. As I’ve already mentioned, the dish is known by many names, but the most popular Chinese name is 拌面/Bànmiàn. A staple of the Uyghur diet, lamb kebabs will have you drooling over a kind of meat you never thought you’d love – lamb. It’s not just the meat, though; the Uyghur use a spice mixture of cumin and pepper that is amazing. If you like kebabs, you might enjoy the conversation with a Uyghur friend of mine who told me the secrets behind the perfect Uyghur kebab. Again, this is something you’ll find all throughout Central Asia, yet the Uyghur people have done a wonderful job putting their own spin on the food. 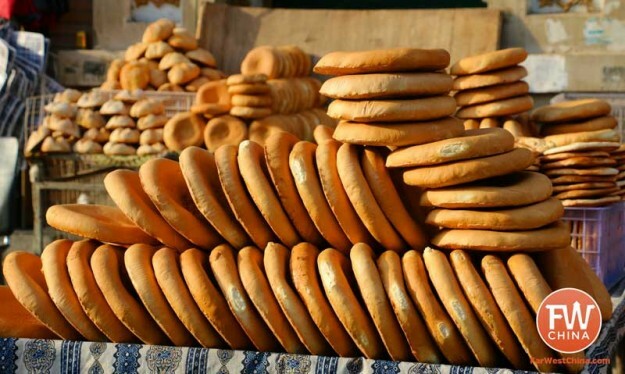 Uyghur bread comes in all shapes and sizes, including flatbread and thick bagel-like bread. I recently had the opportunity to learn how to make Uyghur bread. 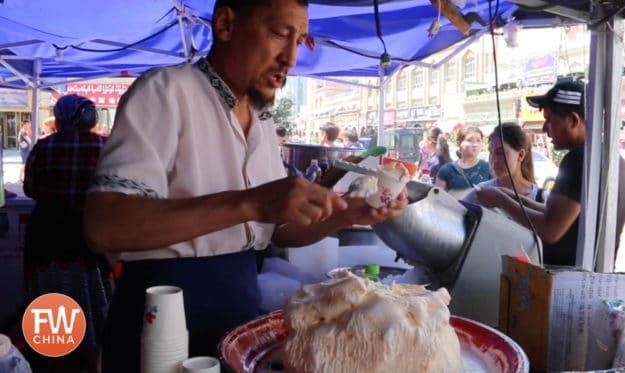 During the summer months, you might see mounds of ice cream being served from street carts in Xinjiang. This is affectionally referred to as “Uyghur Ice Cream“. Although it’s different than traditional ice cream, it’s still the perfect summer treat. A cup usually costs only a few kuai and there are a few different flavors I’ve tried. I once described Uyghur samsa as “a grilled Hot Pocket“. A mixture of lamb meat and onion is covered with breading and baked until crisp. 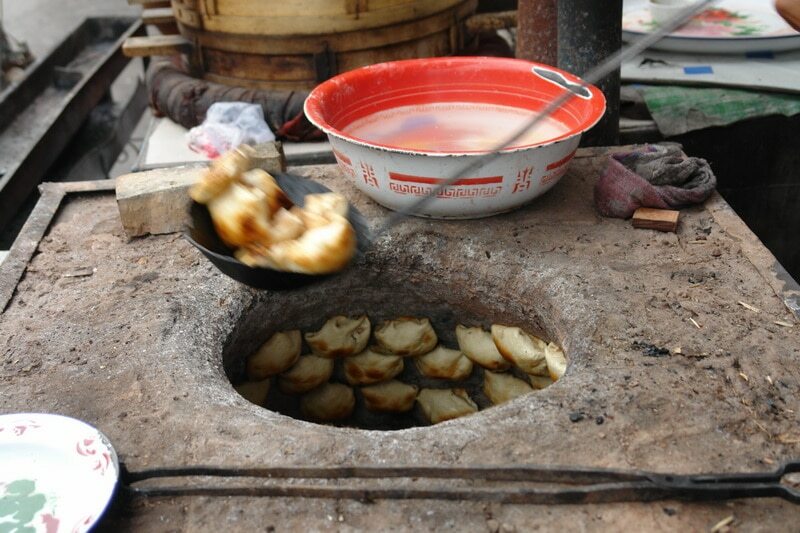 It’s an oily treat (as is most Uyghur food, for that matter), but enjoyable none-the-less. These treats also make great snacks to bring on a bus or train for a long ride. A lot of people mistakenly think this is a Uyghur dish when in fact it is part of the Hui cuisine. The name directly translates to “Big Plate Chicken” and it’s a pretty good description: it’s an entire chicken, cut up and cooked with potatoes, onions and other vegetables and served on a big plate. Generally speaking, this is a dish you’ll want to share with a group of friends. It’s best served with Uyghur flat bread (see #4 above). This is a surprisingly good dish that’s worth a try. A rice and lamb meat mixture is stuffed into lamb intestine and served along with lamb lung. Don’t knock it before you try it! 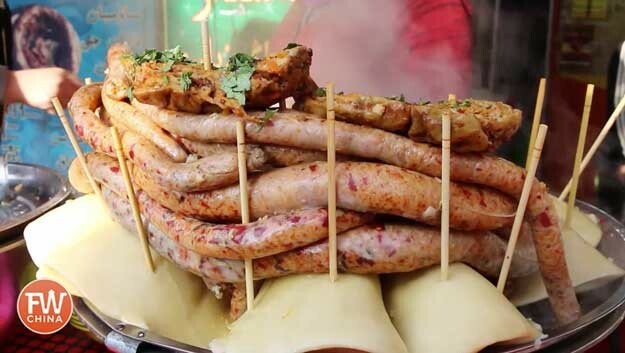 Learn more about Uyghur stuffed lamb intestine here. Uyghur matang is a nut snack (walnuts, almonds, etc.) usually sold on the streets by Uyghur vendors. 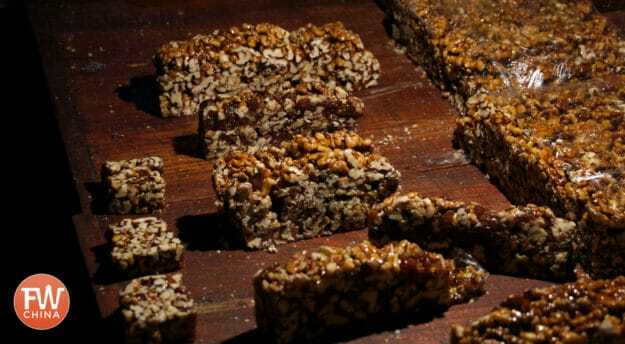 It’s extremely chewy but easy to transport, so it makes for a fun snack on the bus or train. You usually buy matang by the slice and often you’ll have a number of different varieties to choose from. 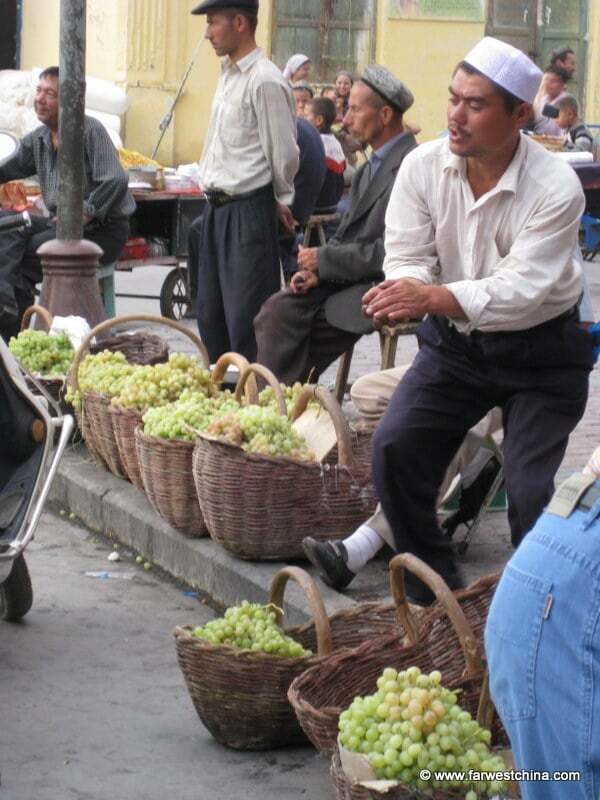 Did you know that people in Xinjiang eat more fruit per capita than any other region in China? (check out other interesting Xinjiang facts) It’s true, and one of the reasons is that we have the best fruit. Almost every region of Xinjiang has it’s “specialty” fruit and if you can find out what it is (i.e. Hami melon, Turpan grapes, Korla pears, etc. ), buy some to enjoy. 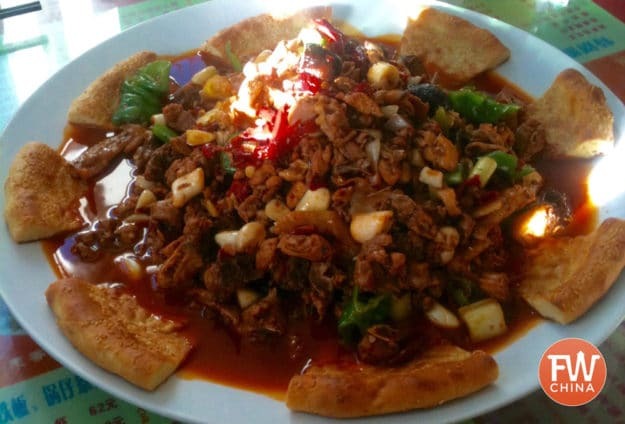 Conclusion | Best Xinjiang Foods? So what do you think of this list? Like I said, I’ve left a number of great dishes off the list. If you think one of your favorites is worth a mention, please let me know in the comments below! Also, if you’d like to download a reference guide for these foods and how to say them in both Chinese and Uyghur language, join the FarWestChina community using the button below. I’ll immediately send it to your inbox! Thank you to publish my last commentary on your blog . You certainly know most than me than the Ouzbeck have a relationship with the Ouygours and in my article, http://jmmartin.unblog.fr/2014/10/07/20-000-kms-en-tricycle-couche-n9-septies/ at the end, I ask what is the difference between the “Sonem” and the “Longham” .. Your article is, of course, most full than mine and I’m eulogistic on it ..
Great article, Josh! I think you just about covered the top Uyghur dishes. The only food that I would add would be Uyghur yoghurt. When we lived in Kashgar, we bought fresh yoghurt made that same morning. It was a little tart compared to store-bought yoghurt, so most people added a bit – or a lot! – of sugar, but I liked eating it straight! Mmm! Delicious! My favourite is those little lamb pies cooked inside a circular oven. The best I ever ate were in Kuche at the night market, but they sold out quickly. At the animal market in Kashgar they make mounds of them and it’s interesting to watch the whole efficient operation. Thanks for the comment, Deirdre. I believe you’re referring to the samsa I mention above? It sounds like it’s the same thing. Great video! Thank you for covering such interesting topics. My pleasure, Steve! Thanks for the comment. Thanks for this! I’ve been a few times to xinjiang but I never ate their Uyghur Ice Cream. Seems something delicious! I’ve noticed that they eat much more fruit in Xinjiang than in other regions, definitely going to try out Korla pears. I think I already ate the Hami melon! Absolutely. My advice is to stop any time you see a fresh fruit stand in a city and see what’s fresh. You may be surprised at what you find (or maybe don’t even recognize!). Great and helpful post! I particularly enjoy Samsa (for simplicity in the ingredients, yet very juicy and tender lamb meat) and Polo (well, Im from Indonesia, this rice-dish kinda reminded me with our popular nasi goreng).